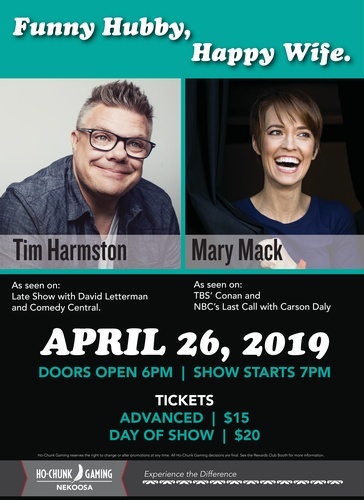 Tim Harmston has been on Late Show with David Letterman and on Comedy Central while Mary Mack has appeared on TBS’ Conan and NBC”s Last Call with Carson Daly. Advance tickets are $15 and day of show are $20. Each ticket will receive $10 Rewards Play on the day of show. Doors open at 6 pm with a show start time of 7 pm. Get your tickets today by calling 800.782.4560 ext. 8319.